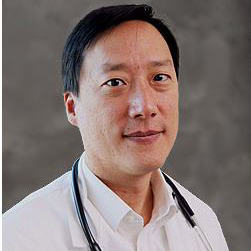 Dr. Chung has been living and working in Nairobi, Kenya and Hanoi, Vietnam since 2002. At these sites in Africa and Southeast Asia, he has been involved in HIV treatment and care, field epidemiology research, and medical education. He has led several randomized controlled trials on a variety of topic including perinatal transmission of HIV, adherence to antiretroviral medications, antiretroviral resistance, and treatment of cervical intraepithelial neoplasia among HIV-positive women. In 2004, Dr. Chung co-founded the Coptic Hope Center for Infectious Diseases, an HIV clinic in Nairobi which is one of the largest single-site antiretroviral treatment centers in Kenya. He is the Director of the Treatment, Research, and Expert Education (TREE) program which is dedicated to addressing the health needs of people living in resource-limited settings through quality medical care, academic research, training and education. Dr. Chung's current interests include cervical cancer screening and treatment of HIV-positive women, education of health care workers in resource-limited settings through the internet, and testing for antiretroviral resistance using a simplified assay to guide HIV treatment. In addition to holding appointments at the University of Washington, Dr. Chung currently the Chair of the Department of Medicine at Aga Khan University in Nairobi, Kenya. Dr. Chung believes that global health research should answer scientific questions that are relevant to populations living in resource-limited settings. He has engaged in studies and clinical trials on global health topics including: adherence to antiretroviral medications, HIV drug resistance, cervical cancer screening and treatment, perinatal transmission of HIV, and HIV implementation science. A few of his key areas of study are described below. Without proper adherence to antiretroviral medications, drug resistance in HIV-infected individuals may develop and lead to treatment failure. Because of the high prevalence of HIV, antiretroviral resistance in sub-Saharan Africa has profound public health implications. Dr. Chung has led and participated in two randomized controlled trials (RCTs) to examine adherence interventions in Kenya. In one study, he found that intensive early behavioral counseling at ART initiation was highly effective while carrying a pocket alarm device was not. In another, he found that patients who received text messaging support through a cell phone similarly improved their adherence and suppressed their viral loads. A Cochrane review of 182 publications found that these were 2 of only 5 high quality RCT studies that could demonstrate improved adherence and biological outcomes to any medication adherence intervention. HIV resistance to antiretroviral medications can be transmitted between individuals and may lead to infection with an HIV strain that can render first-line antiretroviral medications obsolete. As the prevalence of pre-treatment drug resistance (PDR) and general antiretroviral resistance increases in resource-limited settings, inexpensive laboratory assays are needed to guide local clinicians. Dr. Chung has recently completed an RCT examining the use of an Oligonucleotide Ligation Assay (OLA) to detect PDR to guide antiretroviral (ART) regimen selection in Nairobi, Kenya. Through this research, his TREE laboratory in Nairobi has established the country’s capacity to conduct OLA resistance testing and will soon examine OLA as a point-of-care (POC) test. HIV-infected women are at higher risk for cervical cancer, but scientific evidence on the best screening and treatment methods in resource-constrained settings, where most of these women live, is limited. Dr. Chung and his team have screened over 7,000 HIV-infected women for cervical cancer in Kenya and have recently completed an RCT comparing cryotherapy vs. loop electrosurgical excisional procedure (LEEP) to treat pre-cancerous cervical lesions in this population. In this study, 400 HIV-infected women were enrolled, treated, and followed over two years for HIV cervical shedding and recurrence of pre-cancerous lesions. These findings are being analyzed for presentation and publication and includes collaborations with the Centers for Disease Control and Prevention (CDC) and the Harvard School of Public Health to investigate cost-effectiveness, human papillomavirus (HPV), and other cancer biomarkers from this trial. In addition to these ground-breaking RCTs, Dr. Chung has been engaged in a number of other global health studies. Dr. Chung has been examining the progression of chronic lung disease among HIV-infected individuals in Kenya, and has published over 20 papers in HIV implementation science and prevention of mother-to-child transmission of HIV (PMTCT). Finally, Dr. Chung is collaborating with Sun Yat-sen University and examine utilization of health care services in Kenya by Chinese migrant workers in a project funded by the China Medical Board. Chung MH, McKenzie KP, De Vuyst H, Richardson BA, Rana F, Pamnani R, Njoroge JW, Nyongesa-Malava E, Sakr SR, John-Stewart GC, Mugo NR. (2013). Comparing Pap smear, VIA, and HPV cervical cancer screening methods among HIV-positive women by immune status and antiretroviral therapy. AIDS, 27(18), 2909-2919. PMID: 23842133. Chung MH, Richardson BA, Tapia K, et al. A randomized controlled trial comparing the effects of counseling and alarm device on HAART adherence and virologic outcomes. PLoS Med. 2011; 8(3): e1000422. PMCID: PMC3046986. Chung MH, Severynen AO, Hals MP, Harrington RD, Spach DH, Kim HN. (2012). Offering an American Graduate Medical HIV Course to Health Care Workers in Resource-Limited Settings via the Internet. PLoS ONE. 7(12): e52663. PMCID: PMC3527561. De Vuyst H, Chung MH, Baussano I, Mugo NR, Tenet V, van Kemenade FJ, Rana FS, Sakr SR, Meijer CJLM, Snijders PJF, Franceschi S. (2013). Comparison of HPV-DNA testing in exfoliated cells and tissue biopsies among HIV-positive women in Kenya. International Journal of Cancer, e-pub Feb 27 2013. PMCID: PMC3707962. Marson KG, Tapia K, Kohler P, McGrath CJ, John-Stewart GC, Richardson BA, Njoroge JW, Kiarie JN, Sakr SR, Chung MH. (2013). Male, mobile, and moneyed: loss to follow-up vs. transfer of care in an urban African antiretroviral treatment clinic. PLOS ONE. 8(10): e78900. PMCID: PMC3812001. Van der Kop ML, Karanja S, Thabane L, Marra C, Chung MH, Gelmon L, Kimani J, Lester RT. (2012). In-depth analysis of patient-clinician cell phone communication during the WelTel Kenya1 antiretroviral adherence trial. PLoS ONE, 7(9): e46033. PMCID: PMC3457960.